What if you never missed an election again? What if no one did? 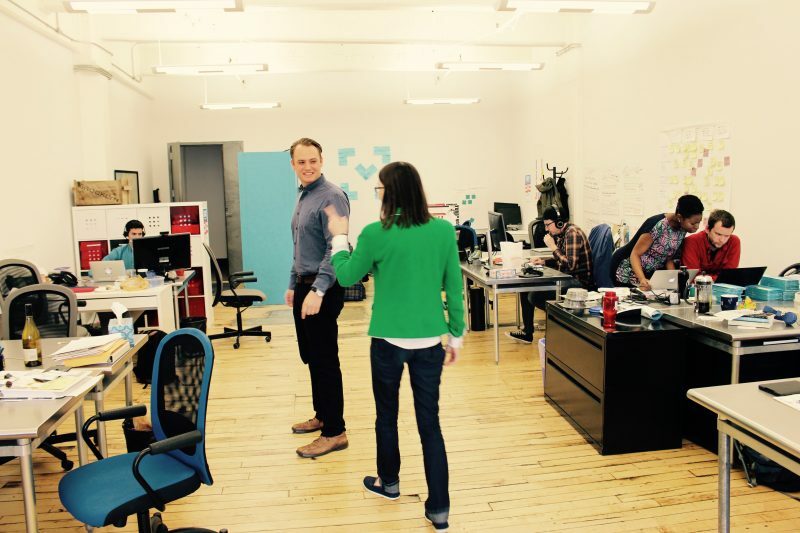 Seth Flaxman and Kathryn Peters, the cofounders of Democracy Works, are here to help. The idea for Democracy Works began when, after moving for a graduate program at Harvard Kennedy School, Seth missed several elections. He began looking online for a service that could remind him about upcoming elections, assuming that the Internet would have solved this problem like it had so many others. But there was nothing. He had been looking for an entrepreneurial idea to strengthen democracy, and he realized he may have found it. He approached Kathryn, a classmate who he thought would have an idea of how such a service could be built. Kathryn’s first reaction, like Seth’s, was to assume that it must already exist. In fact, for her it did—as a resident of Boone County, Missouri, she already received email reminders about elections from her County Clerk, Wendy Noren. “If Wendy can do it, so can we. For everywhere,” Seth adds. It hasn’t been easy. Many election rules are determined at the county level, in eight thousand different jurisdictions across the country. 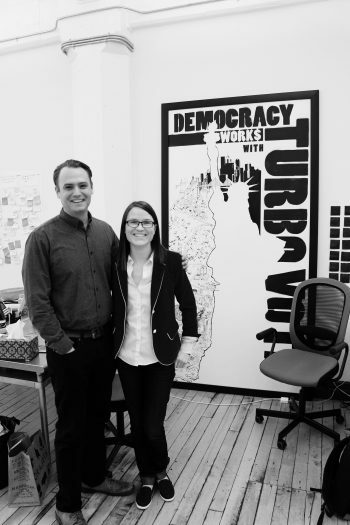 But six and a half years later, TurboVote, the first tool Seth and Kathryn created together as Democracy Works, has more than 400,000 users, who receive customized election information via text and email. The Rita Allen Foundation has supported Democracy Works with a series of grants since 2012, including grants for building partnerships with election officials, colleges and universities, and companies. It also recently supported a case study produced by the Kennedy School to help aspiring social entrepreneurs learn from Democracy Works’ growth, part of the Foundation’s efforts to increase knowledge sharing in the nonprofit sector. With the TurboVote Challenge, launched early in 2016, Democracy Works is building a powerful coalition of companies and organizations committed to helping employees, customers and communities build their civic engagement. There are now more than two dozen partners in the Challenge, including Starbucks, NBC, Univision, Target and Spotify. Their goal? To help the United States reach 80 percent voter turnout by 2020. 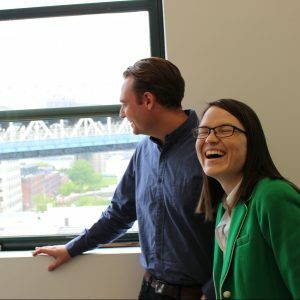 In a recent conversation in the offices of Democracy Works, in a converted warehouse in the DUMBO neighborhood of Brooklyn, Seth and Kathryn spoke about what’s ahead, what makes their partnership work, and what they’re learning about building a successful civic tech startup. SETH: The next months are almost all about execution. For the companies we’ve launched with, it’s about making sure they have successful experiences and they have good campaigns. In some sense we’re learning as we’re doing it. KATHRYN: In the same vein, we’ve found that presidential years bring extraordinary attention and focus on the work that we do. We spend the other three years building out steady infrastructure, and this is a year where we can bring people in. This year is about taking the infrastructure we’ve already built and scaling that as far as it will go, so that in 2017 we can be in the process of building out the next wave of infrastructure that will be necessary to get to 80 percent. What do we need to build together with this new expanded group of partners and stakeholders? It’s exciting. No pressure or anything. SETH: I only like scary goals. In for-profit tech startups, cofounder relationships are common, but they seem less so in nonprofits. SETH: I think it’s harder to sustain these sorts of relationships in nonprofits. Getting a big payday keeps a lot of founding teams together on the for-profit side. On the nonprofit side, you have to really work on your cofounder relationship to collaborate well. KATHRYN: I wonder if the ratio of lone founders and co- and group founding is different? I wonder if anyone has researched that? SETH: You can already tell our relationship here. I already have a theory and Katy is like, but is that true? KATHRYN: I want to go dig into this now. Yes, I think we’ve found a really good relationship. Seth cooks up ambitious goals and I talk some of them back and build the rest into existence perhaps. We have a bit of a push-pull. He’s very much our creative mind, and then I get to figure out how to execute. SETH: I often think about it as Katy running the train while I build the tracks. KATHRYN: He’s got the picture of more than six months out clearly in his mind for some number of years into the future. If I’m looking more than six months out that’s incredibly rare. Just making sure that tomorrow goes smoothly is a lot more where my focus needs to be. You must trust your track builder. KATHRYN: Yeah, actually. It’s been six and a half years now. We’ve figured that out little by little along the way. Can you trace changes in how you’ve worked together over those years? SETH: I’m a big proponent of founding teams as opposed to founding individuals. There’s a myth of the solo entrepreneur that does damage to the startup space in general. If you look historically at successful startups, nobody did it alone. It was always a team. So it sets up a false expectation of what success looks like. You need a group of people with diverse skill sets to get anything done. No one has all the skills you need to launch something. If you want a successful founding relationship, it’s going to be years where you’re literally checking almost every decision with the other person before you move ahead. For some people who would fancy themselves founders, that sounds horrible. Because they envision being a founder to mean that they call the shots, they can do whatever they want, when they want. I think you’re much more successful if you bring people along with you. Partly that’s to make sure the decisions get made right. But even when we disagree, it’s still important to hear a different perspective. And usually we do agree, and then it gets everyone on-page for what needs to happen. I had to learn that skill myself for the first year and learn the importance of it, and then there were a few years where that was the modus operandi. Then I would say in the past year or two we’ve built enough of a foundation of trust that we will check in as regularly as we can, hopefully weekly, but we’ll do a bunch of work and then come back and check in on things. KATHRYN: We joke that it’s been six and a half years and we haven’t been to marriage counseling yet. There was the wave first of figuring out what our respective skill areas were, and how to break down just the day-to-day of doing the work between ourselves so that we weren’t both doing everything together. Then there was starting to figure out the trust pieces, and which decisions were good to just go run with, and which things we approached with different enough perspectives that they really did need to get checked in on. Then expanding the universe of those, so that increasingly we can take it for granted that we know when we’re likely to disagree and really need to talk, and when we’re going to be just fine. It can save so much time and energy, because we’ve gotten to anticipate each other’s approach in a lot of ways. It’s a really involved relationship you have to build. You have to have a really good, shared vision at the core of it. To some degree, we both care enough about improving voting, improving democratic participation, that everything else has gotten built little by little, brick by brick, on top of that. As you’ve learned how to work together, has your relationship shaped how you’ve built up Democracy Works as an organization? KATHRYN: Absolutely. The word “culture” gets overused and over-glamorized in talking about how you build organizations. But if you need a lot of different perspectives and you need a lot of different skills, culture is that core set of demands about how you expect people to work together. It is those shared values that keep the team together. The ways that we’ve learned to work with each other then play out into who makes a good fit. SETH: One of our early lessons was to take hiring processes extremely seriously, which in some ways is obvious and in other ways is counterintuitive. It’s obvious because when you only have five or six people, which is usually the maximum size team you can build when you’re just starting out, that means the five or six people have to be perfect for the roles. It’s extremely difficult otherwise. That’s true for any small team, to be high performing. But it’s not intuitive at the same time, because the time pressure is so great to get something off the ground and to be successful in a startup that it’s easy to say—no, we shouldn’t have three rounds of interviews and a test at this stage. One of our early lessons was to really have intense hiring processes. SETH: Many of the successful civic nonprofit startups of the past five to ten years were successful because they were funder-founded. This was entrepreneur-founded—neither Katy nor I are funders. It led to an early strategic focus on financial sustainability through our partnerships, to make sure that we’re building an institution that can last. If we’re successful, we’ll be one of the very few proof points that it is possible. I would like to be that proof point, but that’s definitely what keeps me up at night. KATHRYN: Just as that’s focused on our long-term future, mine is, of course, more immediate. As someone who focuses primarily on building the technology and a product, it is both really exciting and really scary that right now, what our partners most need is not TurboVote the tool—that exists and is ready—but a notion of how to do a voter-engagement campaign at a really large scale. So we’re bringing in an external firm and really learning marketing. That’s an entirely new direction, where we’re in some ways becoming a voter-engagement consulting firm, on top of and around the tools that we’re building. How well can we do that, and how thoroughly can we take advantage of the opportunity the Challenge gives us this year? How quickly can we master that whole new area? SETH: That question has really changed over the past few years. We now have 22 people on staff. What does not keep me up at night is whether I have the right people on my team, or whether we have the right skill sets to do the work. There was a time when I was like—can we even hire engineers into a nonprofit? That was a big unknown. Now we have eight engineers. KATHRYN: The challenges are constantly shifting. That’s why you stick with this. It doesn’t get boring.